Calling all aspiring food photographers! This is fast, exciting, highly informative and fun! Minimum requirement is a point and shoot (phones and other portable devices are allowed) 6 mega pixel camera. 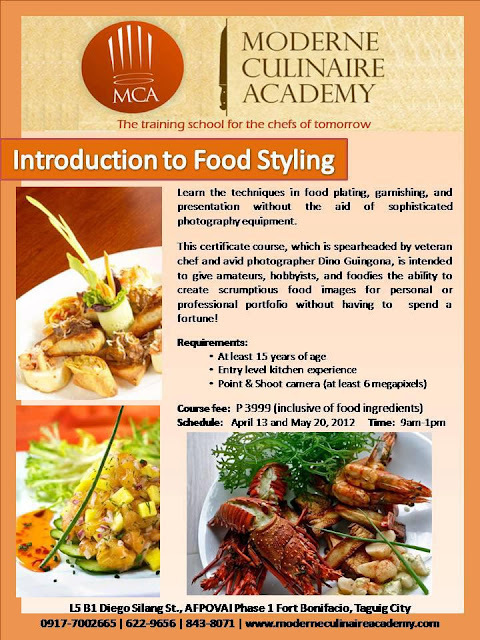 On May 20, 2012 at 9 am to 1 pm, Moderne Culinaire Academy will be having a workshop dubbed as An Introduction to Food Styling. Let Chef Dino Guingona, also an avid photographer teach you how a professional food stylist prepare a sumptuous plate ready for the taking...oops the camera! A simple point and shoot "thingamajig" can do the job. A few of P3999 (includes food ingredients) will give you an advantage in your food business or your foodie-hobby.